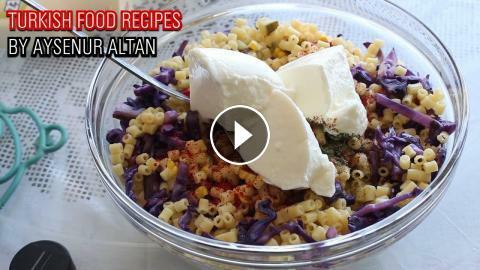 Easy and healthy pasta salad with vegetables like peas, red bell pepper and red cabbage. With it's delicious Turkish yogurt sauce it will be your one of the favorite pasta salad recipes. For the recipe i used vegetable that i put in the freezer when it is the seasons. But you may use store bought, fresh if you can find or canned cooked vegetables also.